In November 2018, much of the western hemisphere sat on the edge of their seats as they watched the Central American migrant caravan march towards the unknown. For many, the thousand mile journey for asylum was seen as trailed with the footprints of relentless bravery. For others, the masses of migrants appeared more like an invasion than a call for help. Regardless, while the nation grew even more divided over the matter, those of us in San Diego had the unique opportunity of witnessing the entire ordeal play out in our own backyard. For San Diego photographer Stephanie Pelayo, this international conflict transformed the way she approached her artwork. 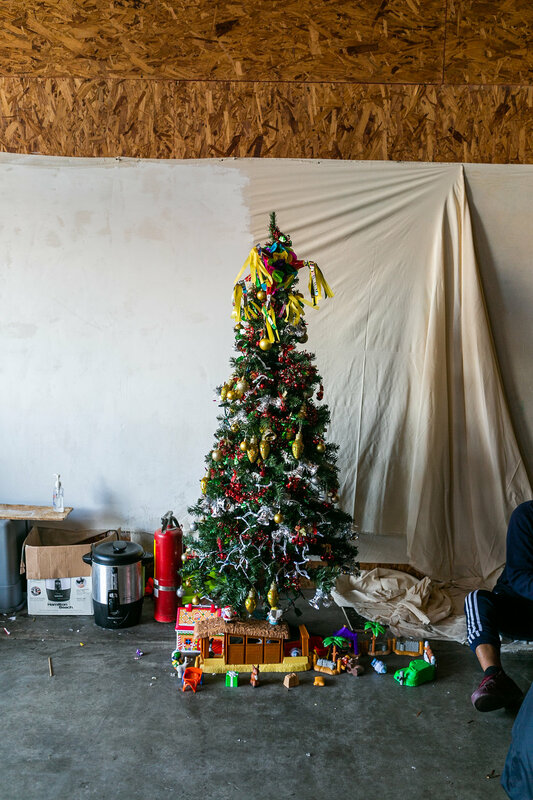 Literally caught within the crisis by chance, Pelayo began dedicating her craft to documenting the caravan's cross-border journey—ensuring that their personal stories would not be lost within the sensationalism of the news, but told instead with the warmth of humanity. With cinematic photographs that gleam with the sincerity of human connection, Pelayo captures the crisis in a way most photojournalists never can or will. Children smiling, the sights of lightly-decorated living spaces, a crowd of young adults casually giving each other haircuts, etc. They're ordinary scenes that only become striking when placed in the context of the news surrounding them. To the world, they are a crisis. To Pelayo, and now to us, they are family. We got the opportunity to speak with Stephanie Pelayo and ask her about her upbringing, her current projects, and the narrative told through her artwork. Read up below. First and foremost, can you introduce yourself and what you do? Hello! My name is Stephanie Pelayo from San Diego, and I am currently an independently wandering photographer with an interest in border issues. I also have two cats and an incredibly supportive boyfriend that I very much adore. How long have you been shooting photography? When did it become something you started taking seriously? It’s been a while now. It started around the time when I was 12 years-old after my dad brought home a digital Canon camera. I was immediately intrigued when he showed me it’s functions and I haven’t turned back since. Growing up after that I that my father got scared of my newfound obsession because I wasn’t doing well in school, and as a consequence, I felt a bit shunned for wanting to be a ‘photographer’. However, I did use my quinceñera money to buy my first digital camera (thank god I’m Mexican). Once I graduated high school, I used what skills I had to make extra cash by photographing wedding, headshots, quinceñera’s, whatever would pay. I didn’t really allow myself to dive into the craft until after I graduated from UCSD. I had a moment of clarity and happily gave up the notion of heading to medical school, because did I really want to do that for myself? No. I have since been working to find my voice in my craft in order to finally make it my own. Can you tell us a bit about your 'Caravan Dream's series and how that has affected your work since? It honestly started through bittersweet luck and coincidence. 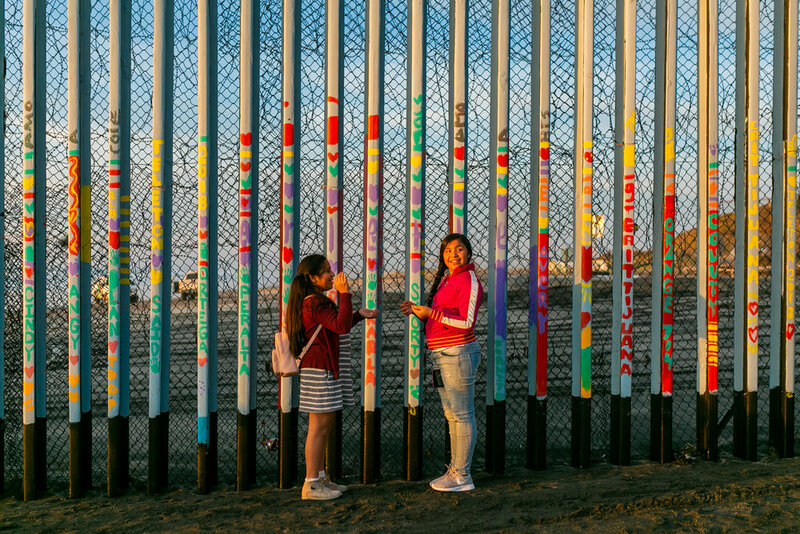 My boyfriend and I crossed into Tijuana on November 23rd, 2018 in order to transport a car full of donations to the border angel’s headquarters in Playas. On our way back home, while driving on the 1D highway, we came across tear gas and hundreds of people running in all directions over the Tijuana riverbank. I am a bit crazy to the extents that I go to in order to document something that I deem as significant, so I parked my car as quickly as possible and sprinted across the highway on onto the embankment to document. Once we got back home, I saw a major disconnect from what was being reported and what I saw first-hand. This frustrated me deeply, so I made it a point to visit the shelters (mainly Benito Juarez) so that I could somehow counter the false narrative through my photography. I have since taken a break due to security issues, however, it has given me a new-found passion to document trans-border experiences and events. Is there a narrative you try to tell through your photography? Much of your photography is centered around scenes surrounding the trans-border experience, though caught in a completely cinematic way. What do you think it is about those scenes that catch your eye the most? Often times I see the gritty and harsh realities in the work of many photojournalists, and I love that honesty, but when I see things unfold in front of me, whether its small nuances in an individual or a catastrophic event, I see humanity and it’s complex beauty. I want people to see that too. Something I admire about your artwork is how organically human and genuine each photo feels, almost less like portraits and more like warm images from someone's photo album. How important do you value that bond between you and your subjects? That’s probably one of my favorite critiques that I’ve heard about my work, thank you! I think the human connection is one of the most crucial requirements needed to make a truly complex photograph. A lot of times all that it really requires is some patience and an open ear, whether you agree with your subject or not. And I say this in part because at this point in history I see so many people refusing to do just that. I don’t think a person can begin to understand the world around them if an attempt at humanization is not made. I want to be known one day as a photojournalist, and I hope I am paving my way down that road with my work and ideas.